Lakeside Cabin in Hot Springs National Park! Find serenity at this 1-bed, 1-bath vacation rental cabin in Hot Springs National Park. This waterfront abode boasts accommodations for 4 guests to enjoy leisurely lakeside activities just outside your back door. Your vacation begins the moment you walk into this nautical haven that boasts everything you need to elevate your lakeside holiday. Sit back and enjoy the views of the peaceful lake from the back porch The lush, forested backyard with a hammock is perfect for afternoon siestas with serene surroundings. 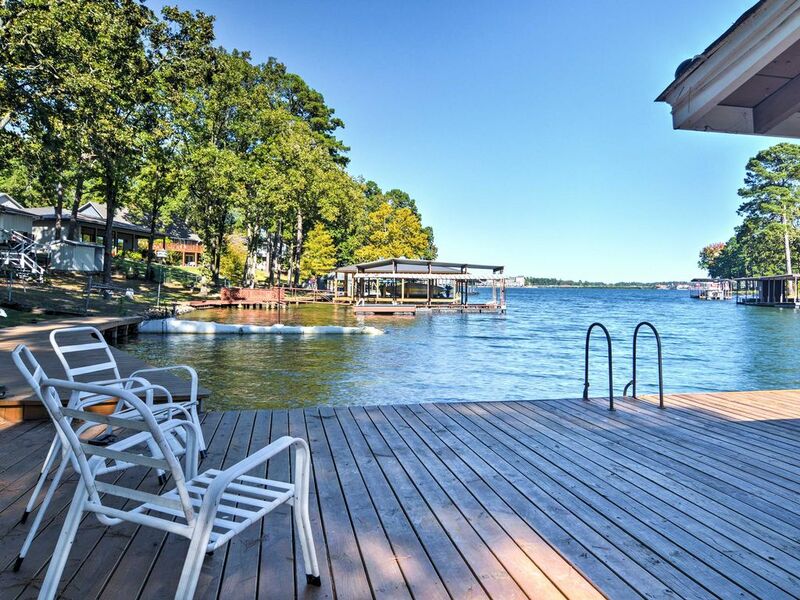 Put on your bathing suit and dive into some lakeside fun from the private dock! Lounge around on the patio furniture and soak in the sun while you enjoy picturesque views of Lake Hamilton. Head home to the fully equipped kitchen and whip up hearty meals to rejuvenate your travel companions from their day on the lake. Share a meal around the rustic table with seating for 4 to enjoy your home-cooked meal. To further unwind, put your feet up on the sofas and turn on the flat-screen cable TV to stay up to date on your favorite shows. Retreat to the cozy bedroom featuring a queen-sized bed with 600-thread count sheets for an optimal night’s rest! In the morning, refresh in the full bathroom complete with a shower/tub combo. When you're not taking advantage of this lakeside retreat, hop on one of the bikes and ride into the charming town of Lake Hamilton. Enjoy the restaurants, shopping, spas, and more that line Central Avenue. Just 13 miles away is the enchanting Hot Springs National Park, also known as "The American Spa." Tour the historic Fordyce Bathhouse, take a soothing bath in the thermal waters, hike to the Mountain Tower, and drive through the scenic mountain roads for an adventure filled day. After visiting the national park, explore the vibrant city of Hot Springs! Museums, gardens, bathhouses, theatre, restaurants and more all await at this city by the springs! A short drive down the road is Magic Springs Water and Theme Park, the only theme park located in a national park. This family-friendly park offers thrilling rides, restaurants, games, and seasonal events! Afterwards, cool off at the water park on one of the slides or lounge in a tube around the lazy river with your travel companions! - Amenities include a fully equipped kitchen, bicycles, boat slip, free Wifi, flat-screen cable TV,private deck with outdoor cafe table and lake views, spacious backyard, private deck with patio furniture, boat slip ( you may bring or rent a boat), and much more! - Great Hot Spring location right on Lake Hamilton and a short drive to the magical Hot Springs National Park! By the picture you would expect it to be lakeside but the rental was up the hill past the owners residence and up a fairly steep flight of stairs. Not a good place to rent if you're a senior. Nevertheless,once we settled in we were comfortable. Sheets and towels were provided and there were even extra unopened toothbrushes in case you forgot to bring one. We really enjoyed our visit. Their friendliness and accessibility to their dock was very appreciated. even left us a box of fresh pears on the porch. We would have loved to stay longer.